Choosing an exterior paint color for your home is just one part of the paint-selection process. As a homeowner, you want to ensure that your exterior paint withstands harsh weather conditions and UV radiation. While exterior painters will expertly prepare your home for a smooth, long-lasting paint job, your chosen paint finish can either make or break the final look and longevity of the paint. 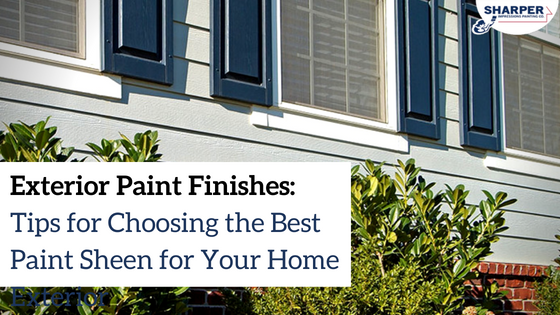 This handy guide will help you choose the best paint finish for your home exterior. Paint sheen is not just about aesthetics. Paint finishes affect how long exterior paint lasts on siding, trim, doors, and other exterior surfaces. There are four different types of paint sheens that professional painters typically use on home exteriors and each has unique benefits when used on the correct surfaces. While flat paint finishes used to be the most popular, they aren’t used much on exteriors these days. Flat paint is matte, porous, and susceptible to fading and mildew problems. Most customers desire paint finishes that are shinier and more durable, but flat paint doesn’t have to be ruled out completely. Because flat paint isn’t shiny, it can be a great option for disguising flaws on older homes. However, a flat finish is only recommended for exterior walls, and not areas that are touched often such as doors, railings, or windows. When to use a flat paint finish: If your home has older wooden siding, or you need to conceal siding imperfections, flat paint can be a good choice. Eggshell paint is the most popular exterior paint finish for the body of a home. Because eggshell isn’t dull like a flat finish, or too shiny like a high-gloss sheen, it looks great on a variety of siding types such as HardiePlank, stucco, horizontal wood, and others. Eggshell paint also offers more durability than flat paint, so it can easily be washed with occasional power washing. It’s also an ideal choice when you need to hide imperfections under the coating on older wood or stucco divots. Eggshell can also protect your home from precipitation and seasonal weather changes. This popular paint finish lays down nicely, so you won’t be able to see any brush strokes, roller edges, or spray marks after applying. When to use an eggshell paint finish: If you’re repainting your house siding and want a low-reflective finish that also conceals minor imperfections. An eggshell finish is also perfect when you need to subtly bring out trim details. Satin paint has a nice sheen and is ideal for exterior trim areas that are used or touched often. This highly durable, stretchy paint resists peeling and mildew. A satin paint finish is perfect for use on a variety of trim areas such as eaves, soffits, overhangs, trim boards, porch ceilings/trim, door frames, window sills, and so much more. It’s important to note that satin paint magnifies imperfections like dents, dings, cratering, and ridges in older wood trim and wood siding. When to use a satin paint finish: If you want a beautiful sheen on your trim that isn’t too shiny, this is the finish for you. This is especially true if you live in a hot, sunny climate as satin paint contains more UV protectant to prevent fading. A semi-gloss paint offers visible shine on home exteriors and is ideal for surfaces that require frequent cleaning. The glossier sheen makes semi-gloss paint more durable than satin, so it’s easier to clean. Semi-gloss paint can also endure harsh weather conditions and withstand excess moisture. While a semi-gloss paint finish can look beautiful on trim details, it isn’t a good choice if you need to conceal cracks, chips, or other surface imperfections. When to use a semi-gloss finish: A semi-gloss finish is best for painting garage doors, front doors, exterior trim, gutters, shutters, metal lamp posts, railings, and window sills. If you want your exterior trim to really pop, then this is the paint finish for you. A high-gloss sheen offers extreme durability and adds a beautiful richness to paint color. You may be tempted to paint your entire home exterior with this easy-to-clean, highly durable sheen, but it isn’t a good idea! Painting all of your siding with high-gloss paint will make your home look “plastic” and magnify surface imperfections. Simply use this finish for highlighting ornate architectural details, trim, and doors. Professional painters will happily paint your exterior walls and siding with a semi-gloss or satin paint to complement the high-gloss finish of your trim. When to use a high-gloss finish: Use this heavy-duty paint to highlight architectural details, decorative fixtures, accent trim, shutters, front doors, black metal railings, window frames, or anything else you touch on a regular basis. House painting tip! Semi-gloss and high-gloss paints can be brittle and chip if not applied to the right surface or with the right preparation. Gloss paints can look amazing on front doors that have been kept in great shape from porches and awnings, but won’t look nice if your door has dings, cracks, or other blemishes. Professional house painters will ensure your home is prepped and painted properly so that your paint job looks amazing and lasts a long time. Paint finishes on your home are just as important as the colors you choose. This is why it’s critical to trust your exterior house painting project to a professional painting company. Not only will professional painters use the right painting tools and techniques to deliver a flawless finish, an expert paint color consultant will help you choose the perfect paint finishes for your siding and trim. Trusting your exterior home painting project to the professionals will provide you with beautiful, long-lasting results. Request your free exterior painting quote today!